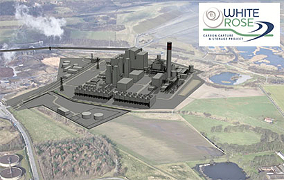 Scottish Carbon Capture & Storage (SCCS) wholeheartedly welcomes today's announcement by the UK Department of Energy and Climate Change (DECC) that a Front End Engineering and Design (FEED) study contract is ready to sign for the White Rose commercial-scale carbon capture and storage (CCS) electricity project. Announcement of a FEED study contract for the Peterhead CCS project is also expected shortly. This gives a huge boost to the UK's low-carbon economy. Both projects will draw on the UK's world-leading research expertise in CCS and proven engineering skills base. They will also enable the development of a CO2 transport and storage infrastructure in the North Sea, the largest CO2 storage resource in Europe. The progress DECC has now achieved renews momentum on CCS and inspires increased confidence that these two projects will be delivered. This is a big step that will help the UK and Europe to match the rapid progress being made on CCS deployment in the USA, Canada and China. This has been a long road for DECC. Since 2007, there have been very significant and unique UK achievements. From a standing start we have seen design and delivery of legislation, regulations and environmental protection measures put in place to enable the development of CCS and realise the CO2 storage potential of the North Sea. Successive UK governments have been advocates for CCS. Today's announcement is not yet the final go-ahead, as both projects still need to undergo an extensive design and contracting process followed by construction. This means that the first CO2 capture and injection would happen around 2018-2020. The UK has one of the world's best finance packages for CCS demonstration. This includes the £1 billion CCS Commercialisation Programme, which is providing financial support for the White Rose and Peterhead FEED studies, and long term Contracts for Difference (CfD) to provide secure revenue for low-carbon electricity. These awards set the UK on a pathway to support the UK's three other world-leading large scale projects - Teesside, Captain Clean Energy and Don Valley - which can bid for funding through the CfD scheme as part of the Electricity Market Reform. The CfD scheme will provide a reliable method for reducing cost to consumers while providing essential funding for CCS developers. Taken together these create a development pipeline of high-value projects - contributing to the delivery of lower cost CCS for both power generation and industrial emissions. The oversized trunk pipeline for White Rose and Yorkshire and Humber, and the establishment of an offshore link from Peterhead will provide opportunities to decarbonise their regional industries. The UK offshore has one of the world's best-understood and accessible storage resources sufficient for hundreds of years of CO2 storage for the UK and Europe. Around 3,000 million tonnes of storage will be needed for CCS deployment from 2025 onwards. These early projects are the critical stepping-stone to demonstrating and delivering access to this storage, building on the UK's world-leading offshore and sub-surface industries. CCS will help the UK to achieve cost-effective decarbonisation of its energy sector by 2030, and throughout the wider economy by 2050. Renewables are already contributing to low-carbon electricity generation. The White Rose, and later Peterhead, FEED studies now signal the start of the process to deploy CCS on cleaning up fossil-fuel electricity generation and industry as the UK makes the transition to a low-carbon future.